"On November 30, 2010, Toyota issued a Technical Service Bulletin that instructs technicians how to repair two weld nuts that may be damaged when removing the bolts used to attach the accelerator pedal to the bulkhead." So says the automaker in a statement you'll find after the jump. It seems this pair of weld nuts on the 2007-2010 Toyota Camry and 2005-2010 Avalon are occasionally stripped during the process of performing one of two recalls instituted last year by Toyota - either inserting a little metal spacer in the throttle pedals in order to ensure the pedals don't stick in the open position or when slicing three-quarters of an inch off the bottom of the pedals so that they can't interfere with the floor mats. According to Toyota, it's not particularly uncommon for nuts such as this to become stripped when removed, which is certainly true. 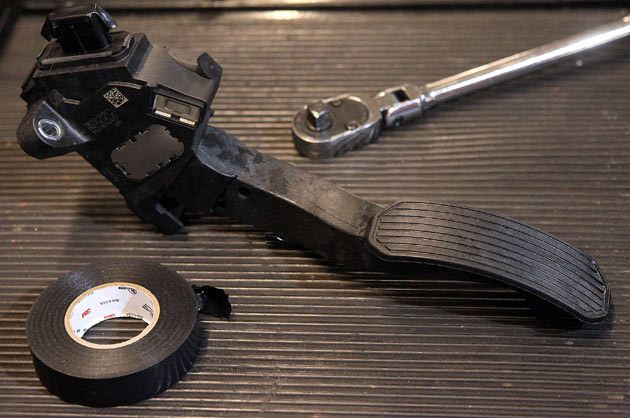 Where some reports differ from Toyota's own statement is whether or not owners prompted the secondary repairs after noticing that their pedals weren't firmly attached to their cars after the original recalls were completed. Consumer Reports writes that "as many as 500 owners of those cars have complained of gas pedals that feel loose or have play side-to-side." Toyota, on the other hand, claims that "no customer vehicles on the road are affected" and that "suggestions that this TSB was issued to resolve customer complaints about accelerator pedal feel after the recall or that this TSB is a recall are wrong." Whose report is accurate? That's up for discussion. Feel free to read Toyota's official statement after the jump and read CR's initial report here and try to figure out this mess for yourself. Camry pedal recall prompts secondary repair, Toyota denies it's recalling a recall originally appeared on Autoblog on Fri, 03 Dec 2010 11:28:00 EST. Please see our terms for use of feeds.